This unique solvent is specifically blended for conversion topcoats and sealers. It can be used to reduce the viscosity, slow down the drying time or for clean up. 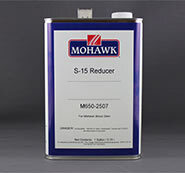 Use only the Mohawk Conversion Varnish Reducer/Retarder to insure compatibility and professional results with the Ultra Clear Conversion Varnish topcoats and sealer.